Citation tools help you organize, manage and format citations and create bibliographies. With the help of citation tools, you can easily capture the bibliographic information you need for creating a citation, and format it in the citation style of your choice. Most citation tools work with word processing software and offer a plug-in that inserts footnotes or citations into your paper and creates a bibliography for you while you write! You can compare available citation tools here. Need help with these? Contact us! Most of the library databases have built-in citation tools. 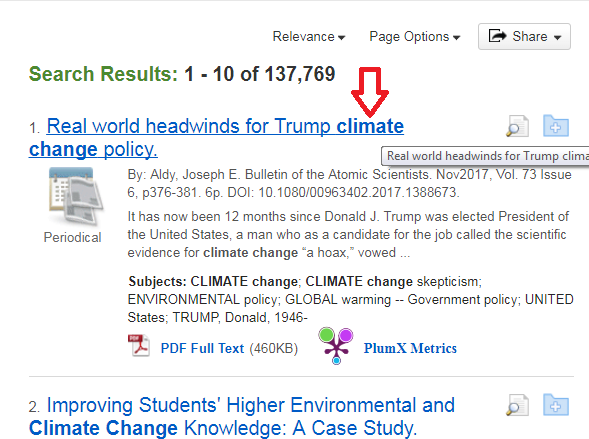 From your search results list, click on an article title. On the article's detail page, click Cite from the Tools menu on the right-hand side. In the Citation Format pop up window, scroll down the list to find the format you need. Citations formats include APA, MLA, and Chicago/Turabian. Copy and paste your preferred citation from the list into your document. Or, click on the Export to Bibliographic Management Software link in the lower left-hand corner of the Citation Format window if you want to pull the citation information into Zotero. Note: Citations generated may not be 100% correct. Pay special attention to personal names, capitalization, and dates. Check with your professor or a librarian for the appropriate citation format for your assignment.